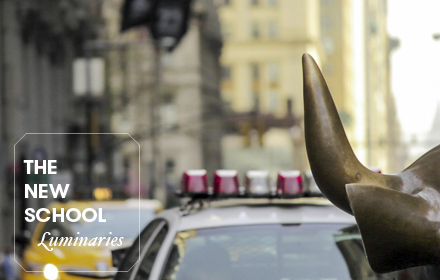 What’s the real story behind Wall Street’s charging bull? Mark Nickolas’s short film, My Life in the Canyon of Heroes, takes a unique perspective: the famous bronze statue tells the audience himself. The School of Media Studies alumnus’s six-minute film was recently selected as a finalist among 24 others for the Smithsonian In Motion video contest. In its inaugural year, the competition recognizes up-and-coming videographers and their original documentaries, up to ten minutes in length. Topics of the more than 200 entries ranged from scenic time-lapses to Brazilian organic coffee and, of course, Nickolas’s talking bull. “Now that it’s under 24-hour police surveillance, the bull’s story has such an ironic twist,” said Nickolas, who shot, edited, and wrote the project for his spring 2012 Cinematic Places class. “Originally a piece of guerilla art, the bull was first impounded and carted away by the very people who are now protecting the statue.” This irony sparked the idea for the voice over film. Nickolas didn’t originally intend for the short film to have life outside of the classroom. At the prompting of Media Studies professor Deanna Kamiel, however, he submitted it to the Smithsonian’s video competition, and then forgot about it. Nearly a year later, a quick Google search showed he was selected as a finalist. Then, the media took notice. Interviews with NPR’s Marketplaceand this week’s Power Lunch on CNBC followed a short Atlantic article. “I just thought it was a quirky little film,” Nickolas said in response to all the attention. Tune into CNBC’s “Power Lunch” segment on Friday, July 19th from 1:00-2:00 p.m. for an interview with the bull and Nickolas. Watch the documentary here.